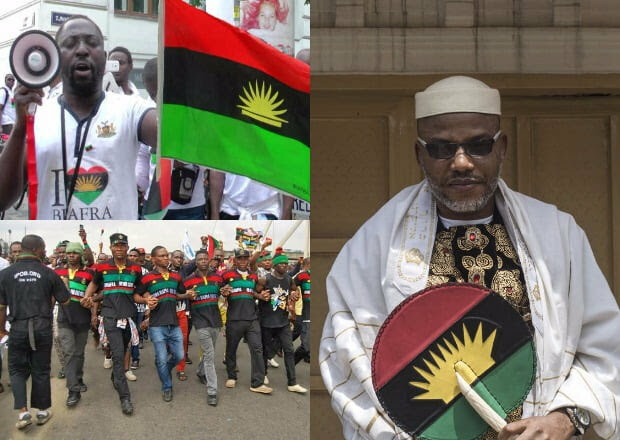 The Indigenous People of Biafra, IPOB, yesterday asked the Court of Appeal to deliver judgment on its embattled leader, Mazi Nnamdi Kanu, whether his case file was missing or not. IPOB had raised the alarm over the purported disappearance of the case file of its leader, Mr Nnamdi Kanu at the Appeal Court. The group said the announcement of the disappearance of the file was a huge joke that further portrayed the rot in the Nigerian Justice sector, while calling on the chief Judge of the federation to step in and salvage what was left of its integrity. IPOB head of Directorate of Service, Mazi Chika Edoziem, in a statement recalled that the Court of Appeal panel heard Kanu’s matter in March 2017, insisting that any attempt to delay the judgment on the ground of a missing file amounted to perversion of justice and criminal conspiracy. According to IPOB, never in the history of Nigeria had it been reported that a case file of such magnitude went missing on the day judgment was meant to be delivered. The statement read: “This very matter, Appeal Case No CA/A/78A/C/2018, which is a legal action against the decision of Justice John Tsoho to reverse himself on an earlier ruling he made rejecting masked witnesses when he was the presiding judge before the matter was transferred to Justice Binta Nyako, is over a year old contrary to the law. “February 13, 2018 was the day Appeal Court of Nigeria agreed, after much protestation from IPOB lawyers and in direct contravention of a key constitutional provision, to deliver its long overdue judgment in the matter of Nnamdi Kanu vs Justice John Tsoho. “On getting to court, instead of the usual adjournment that characterizes IPOB cases in Nigeria and ECOWAS courts, the panel of judges announced, to the dismay of the court and others assembled, that the file was not before them. “Not minding that this was a high profile matter already outside the constitutionally guaranteed three months maximum for delivery of judgment, the lead judge announced that the matter could not proceed, without the case file. “The questions we are asking are; what happened to the decision of the initial panel that heard the case on the 8th March 2017 considering that Appeal Court of Nigeria is a supposedly competent court of records? Where is the copy of their judgment, because judges must have a copy of their judgment in their own personal files? “Assuming and for the purposes of benefit of doubt that Kanu’s file is missing, how about the judgment written by the panel of judges that heard the matter on the 8th of March 2017, which they were meant to deliver on the 8th of June 2017 at the very latest as guaranteed by law? “Does it mean Nigerian courts do not keep records of their judgments or are we to assume that Appeal Court judges are ignorant of the Nigerian Constitution to the extent that they are unaware that the statutory limit on delivery of all Appeal Court judgments is 90 days? “Why wasn’t judgment in this matter delivered within the constitutionally guaranteed 90 days, which is 8 June 2017? What this case is telling the world is that Nigerian Appeal Court judges do not obey the constitution of Nigeria they are supposed to interpret and uphold. “We view this ugly development as a desperate conspiratorial move to deny long overdue justice for Mazi Nnamdi Kanu and IPOB by Nigerian judicial officers on the orders of the Nigerian presidency.